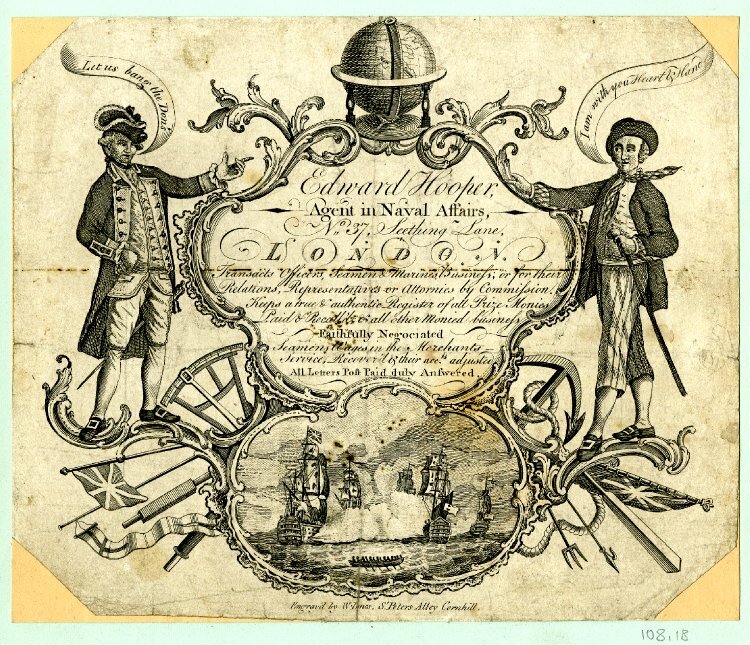 Naval agent's trade card, engraved by W. Jones, c.1779-83, British Museum. Edward Hooper made his living as a prize agent. When legitimate vessels (both civilian and naval) were seized by privateers or naval vessels, they and their cargoes were sold. This sale was divided into shares that the owners, officers, and crew of the victorious vessel would receive. Hooper's job was to divide and allocate those shares, and his pay was a portion of them. 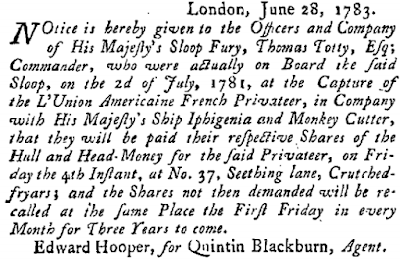 There are a couple references in 1761 to a Lieutenant Edward Hooper of the Royal Navy cutter Success, and it is possible that Hooper began his career as a naval officer before transitioning into the financial sphere. There is not yet any proof that these are the same Edward Hooper. London Chronicle, March 10, 1761, Page 6. Hooper's occupation allowed him to pursue the life of a gentleman.When making a donation to the Marine Society in 1774, the Society took out an advertisement in which his contribution was acknowledged, explicitly stating that Hooper was "A Gentleman." 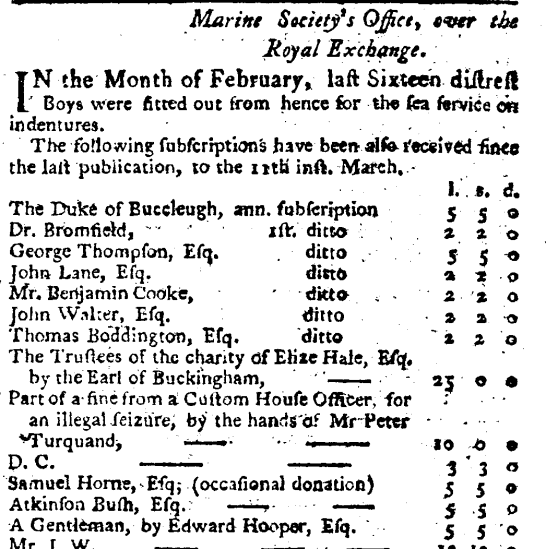 London Evening Post, March 24, 1774, Page 2. He also found the cash to support Innes Munro's 1789 book Narrative of the Military Operations on the Coromandel Coast. Hooper's generosity did not extend to those who wronged him. He appears on occasion in the archives of the Old Bailey bringing cases against men and women who sought to defraud him with false promissory notes. The first to be brought to trial was a man named John Williams in 1763, who was acquitted of the charge, as was Mary Collins in 1765. 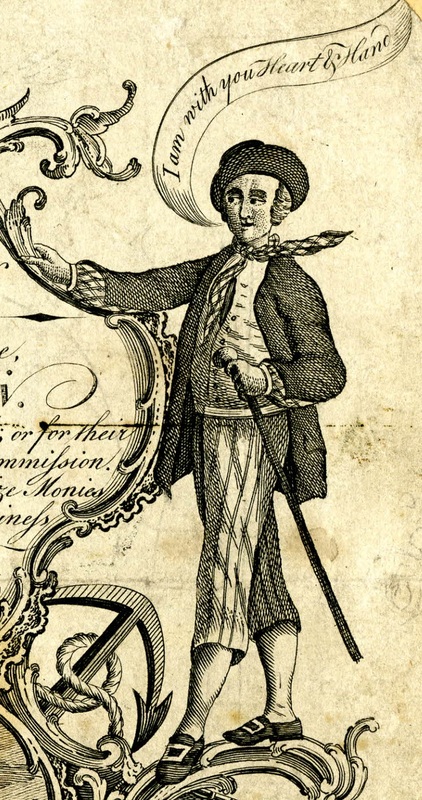 Perhaps this inspired others to try stealing from Hooper, but Elizabeth Dunn in 1765, Catherine Dicks in 1781, her husband Thomas Dicks that same year, Joseph Scott ('a Black without feet') in 1783, were all sentenced to death for the same crime. The jury recommended Scott be shown mercy. 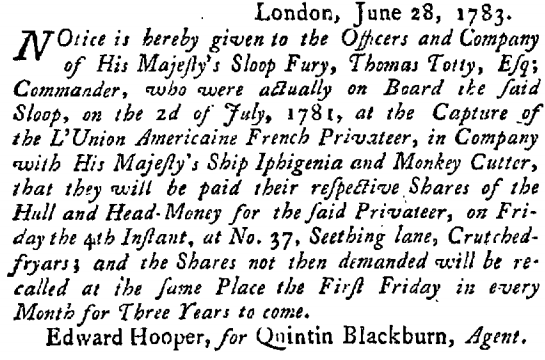 Joseph Phipps was in Hooper's office to claim legitimate prize money in late 1783, but his greed and impatience got the best of him. Phipps slipped out of his shoes to sneak quietly upstairs, and into Hooper's private quarters where he pocketed kerchiefs, shirts and buttons. Phipps escaped the noose, but was sentenced to transportation. Trade cards, including Edward Hooper's, were advertisements meant to draw in potential customers, the same way that a business card does today. Hooper and his engraver, W. Jones, chose to include the customers themselves: a naval officer and a seaman. They are surrounded by the tools and symbols of their profession, including oars, a trident, octant, spyglass, and fouled anchor. A sea battle is depicted beneath a description of Hooper's occupation, which is then flanked by the sailor and officer. 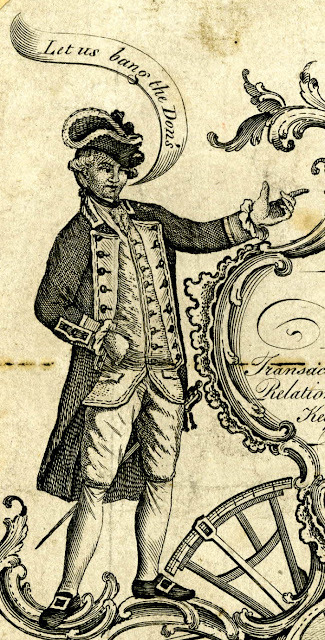 The officer wears a captain's dress uniform per the regulations of 1767 to 1787, which helps to date this piece. He proclaims 'Let us bang the Don's' referring to the Spanish enemies of the Crown. In 1779, the Spanish joined France and the United States against Britain during the American Revolutionary War, which helps us to date this piece. The sailor answers his captain with 'I am with you Heart & Hand.' He wears a round hat with upturned brim and conical crown over a bob wig. At his neck is a tightly wrapped and long check neckcloth that matches the pattern of his shirt. 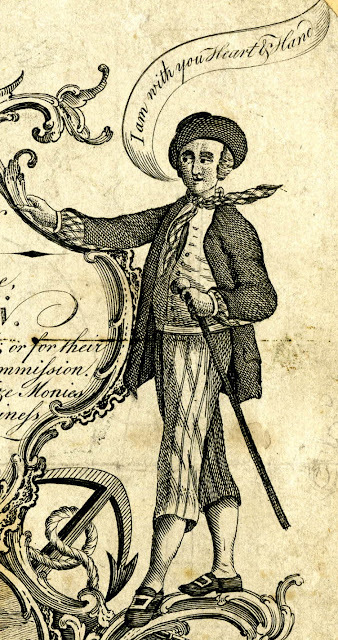 His single breasted waistcoat either cuts off at the waist or is tucked into the trousers, and is open to half way down his torso. The jacket ends about the middle of the thigh and had flap pockets below the waist and open slit cuffs. His trousers cut off at the top of the calf and a close fit with narrow vertical stripes. White stockings run to shoes with rectangular buckles, and he holds a stick in his left hand.